The Exhaust Gas Recirculation (EGR) valve is a pretty straightforward replacement, but you DON'T want to follow the shop manual. The shop manual has you remove the intake and there's absolutely no need to do that - you'll make lots of extra work for yourself. There is also no need to remove the turbo. Instead, you're going to remove the runner pipes from the turbo and go in from the side, above the turbocharger unit. 3 replacement metal gaskets between the runner pipes and the turbo unit (I always use new gaskets whenever I break a seal) One small rubber bushing - it's the same bushing that the pressure chamber bolts go through (rubber with a small rubber sleeve in the middle). There's a long bolt that connects the upper runner to the other, and this little bushing goes in between. Due to the heat generated in that area there's a good chance that the bushing is now hard and crumbled, and will come apart when you remove it, so you'll need to replace it. The EGR valve and gasket (sold as a unit). Lengths of vacuum line - guaranteed the stuff that's there needs replacing or will tear when you remove it. Get the thick-walled silicone stuff from Mazadcomp if you can - it's amazing stuff. I had my new motor completely plumbed with it. Replace any vacuum line that you can - you're there anyway so what the hell. You'll need to pull the air box, hoses and air pump, then disconnect the runners from the turbo. It is very difficult to reach the two nuts in the back of the turbo above the cat, so get a long extension with a swivel socket to reach those from underneath (If I remember correctly, everything is 10mm). 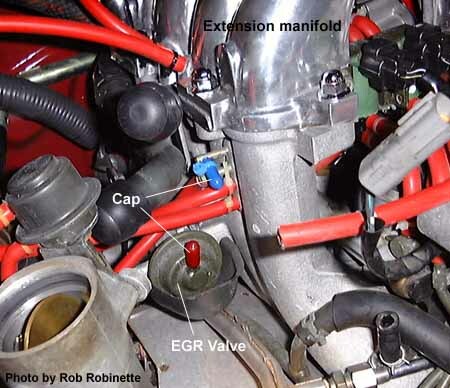 Once you pull away the runners and air hoses/vacuum lines the EGR is right there. Remove, replace, and put everything back together in reverse order. The flag rate for this is three hours, but it took my a lot longer because I removed the intake like the shop manual said. After I figured out it was unnecessary, I was pissed!